I’ve heard a lot about this place and have frequently seen my friends post up food pictures from Shiso Tree Cafe so I thought it was high time that I went to check it out as well. 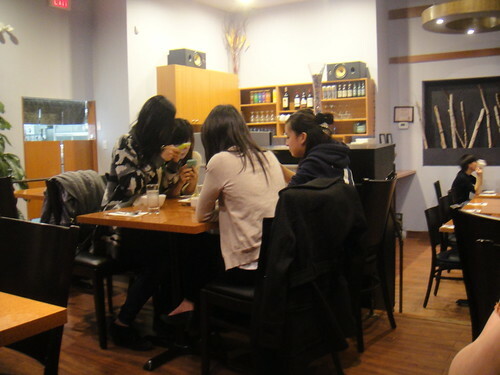 It is a small cafe located in Japantown in Markham. The first time that I stopped by the restaurant hoping to get a bite to eat, it was just after 3 p.m. and they were closed. It turns out that they are open during lunch hours until 3 and then re-opens up again at 5:30 p.m. for the dinner crew. They are closed on Mondays. Last night, I arrived after 7 p.m. and found the place bustling with people already. The first thing that you see when you walk in (after you pull apart the large drapes in the doorway) is the big drum set. The restaurant is modern and understated. Being my first time at the restaurant, I was surprised to find out that this restaurant mainly serves Japanese-style pastas. There is no sashimi, sushi, or udon noodles here. It is all Western style dishes. They have an entire page where they have different types of pastas (separated into “Wafu”, tomato sauce, and cream & rosé cream sauce). You can choose whether you want your pasta paired with smoked salmon, beef, sausage, bacon, shrimps, clams, mushrooms, and many more varieties; one common denominator is that nearly all of the pastas are topped with nori (seaweed) and shiso. Shiso is a type of “Asian culinary herb that comes from the mint family”. All of the dishes were very well presented and looked nice. They also have a page of Fresh Cut Fries on their menu. Each item of fries is made differently, much like when you order different kinds of poutines and there are different toppings on each one. 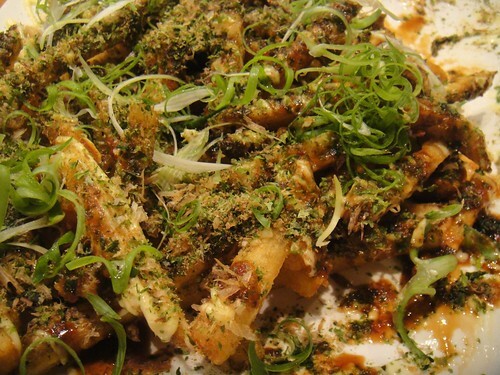 I ordered the “Okonomiyaki Fries” since it looked the most appealing. The plate of fries was huge! 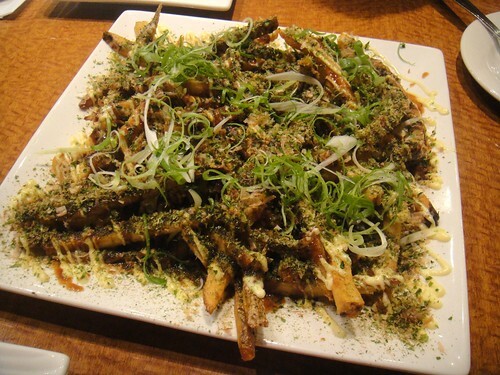 The fries were very crunchy and I found it very saucy with the steak sauce and Japanese mayonnaise. I liked the ample green onions that covered the plate. It was a very unique dish. It’s great for sharing. The Pasta Set of the “Sukiyaki” pasta included a salad, garlic bread, soup of the day, and a slice of cake for $8 more. I really wanted to try have dessert and try their cakes so I thought this was a good deal. 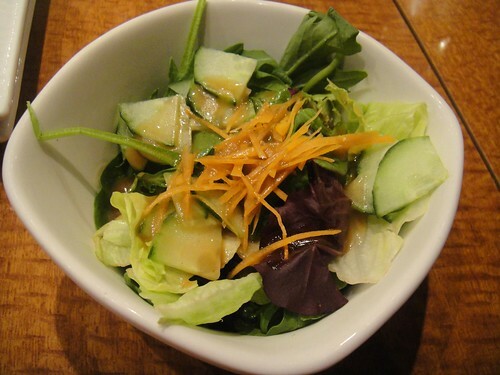 The salad was pretty good; the dressing was just light enough but flavourful as well. 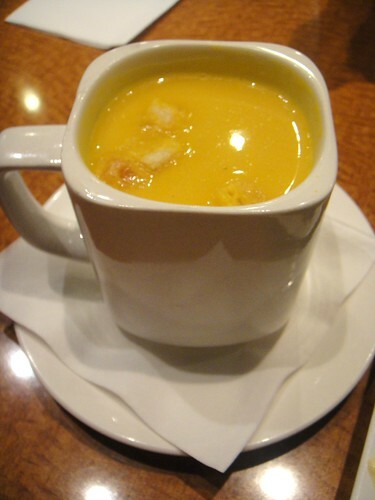 I really really liked the cream of pumpkin soup. It was very creamy! The garlic bread was pretty good too; not overpowering with garlic flavour. 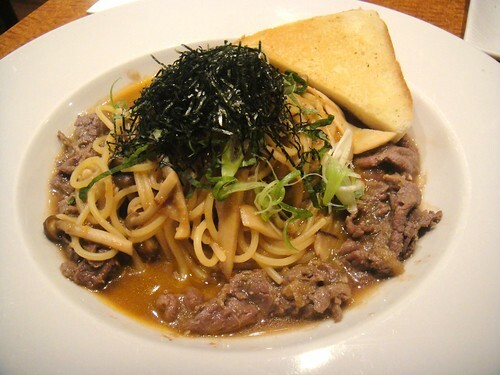 Mmm, the best part was the Sukiyaki pasta. I loved how tender and soft the thin slices of beef rib eye were. It was cooked to perfection, not rough or hard at all! I also loved how piece of the beef soaked up the Japanese soya sauce and beef jus so that the mouthful was extremely flavourful. The mushrooms were yummy and soft as well. Their pasta, according to a lot of past visitors to this restaurant, is always al dente. And it was! The pasta was really well done and when I took my first bite of it on my fork, I also took in the fresh smell of the nori that covered the pasta. It was so good! I looked over at the other tables who were eating and all of them had amazingly beautiful pasta dishes as well. Lastly, when it came to dessert time, the really nice female server brought over a tray of different flavoured cakes for us to choose from. They had mango mousse, cheesecake, chocolate, and tiramisu. I chose the tiramisu one. 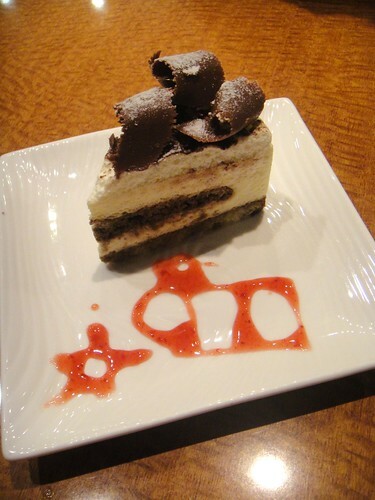 (I noticed that they actually had a green tea one as well, but because another table had already chosen their desserts before us, they took the last green tea cake. This means that the restaurant serves up fresh cakes everyday. A bonus!) The server took the tray back to her station where she decorated my plate before serving the dessert. My fork glided down into the soft cake and it was very creamy and delicious. I liked the chocolate swirls that were on top of the cake as well. 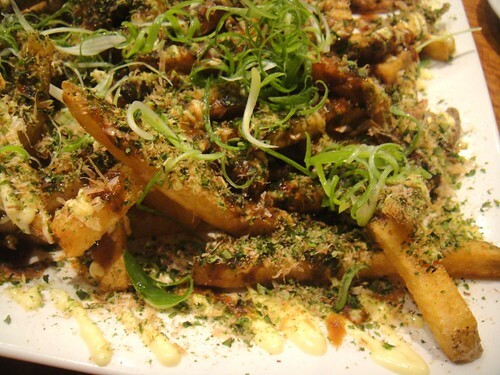 This entry was posted in Food and tagged al dente, food blog, foodie, Italian Japanese fusion, j-town cafe, Japanese cuisine, Japantown, Markham, Okonomiyaki Fries, pasta, restaurant review, Shiso, Shiso Tree Cafe, Steeles, Sukiyaki pasta, tiramisu. Bookmark the permalink. Omg, I had okonomiyaki in Osaka. Those fries LOOK BOMB. Haha, I had okonomiyaki in Osaka as well!! They were the best ones I’ve had since they were made fresh! Out of all the pastas they have, there is an Okonomiyaki pasta on the menu too. 🙂 Lol, I would have loved to try the green tea cake, but tiramisu is good in my books too. 🙂 No reason to get upset over food (this time anyway) ;).